Different HeartFlex movements target specific upper body muscles and allow its user to build and maintain strength in the hands, wrists, forearms, shoulders, chest, and back. 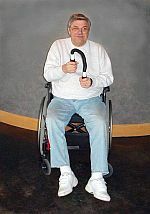 AROM (Active Range of Motion) therapy occurs when MD patients move their body parts without assistance. AROM therapy promotes joint flexibility, muscle strengthening and endurance which builds and maintains daily functionality. HeartFlex is particularly useful for MD patients because it is totally passive and lightweight. It creates easy "consistent" resistance which when combined with multiple repetitions not only builds strong, dense muscle tissue it also stretches muscles to their optimum length. "This device has been used in several classes at The Diabetes Center. It is easy to demonstrate, and patients find it simple to use. It is lightweight and easy to maneuver. It would also travel well. It may be used in a standing or sitting position and can be effective for patients at varying degrees of fitness. We have observed drops in blood sugar from 10 to 60 points after only 5 minutes of activity." HeartFlex is silent and doesn't disrupt radio listening or TV viewing. It is compact, lightweight, and fits conveniently on a bedside table or in a bedside drawer. It also packs easily allowing the patient to perform exercise while traveling. Tension and stress effect patient morale, health, and productivity. Stress may cause depression, headaches, backaches, and lack of concentration. HeartFlexing provides a light exercise that boosts circulation helping to eliminate anxiety and nervous tension. Therapists call this type of device a "fiddle" because people keep it handy throughout the day and "fiddle" with it . HeartFlex multiple sclerosis exercise equipment allows users to develop strength and gently boost circulation over the course of time. 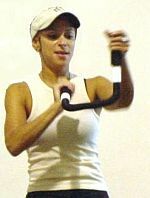 Different exercises have various levels of intensity and the user determines how long and how much to exercise. Swimming and HeartFlexing are easy to do for short periods. They both become progressively more intense by adding repetitions. Both workouts can be easy for beginners and may be made intense enough to challenge the most elite athlete - just by varying the movement, rhythm, and number of repetitions performed.